A Living Documentary: Sharing Testimonies of Forced Sterilisation – In the 1990s, many indigenous men and women in Peru were subject to a forced sterilisation campaign; the Quipu project is working with local communities to create a way to make these stories heard through a combination of low- and hi-tech, online and off. Indigenous Languages are not Dialects- The message that indigenous languages are not dialects is part of a new campaign launched by the Juan de Córdova Research Library of the San Pablo Cultural Center in Oaxaca, Mexico. It aims to change the perception on native languages, that they are not the same as any other global language. Technology for Peacebuilding: an Online Database – The Build Peace Database aims to document crossovers between peacebuilding and new technologies around the world, focusing on communications, networking and gaming technologies. The Birth of Russia's Hackerspace Movement – neuron hackerspace in Moscow is leading the hackerspace movement in Russia. We spoke with neuron's founder about the possibilities for building community and innovation through hackerspaces, while also acting as a link to the country's past. Africa's Technological Potential: the Next Frontier? – As Africa becomes the next frontier for digital development, we take a look a some recent initiatives to explore the way new technologies are developing across the continent. 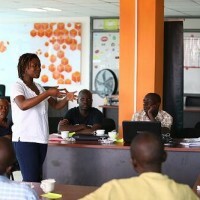 GV meetup in Kampala, Uganda. Brazil: Citizen Journalism for Small Town Change – Amigos de Januária, a grantee project of Rising Voices in 2011, is a group of citizen journalists and activists who continue applying digital tools they used in a single workshop two years ago, to amplify local voices talking about change. Use Civicus‘ new platform to share stories of your civic activism with Be the Change. The International Center on Nonviolent Conflict has a new app out giving access to all of ICNC's educational and research materials, information on its latest activities and news on nonviolent conflicts and struggles around the world. 23 Webmaking Things for Libraries, a list of digital learning activities and tools that you can use in your library – a teaching kit from Mozilla Firefox. 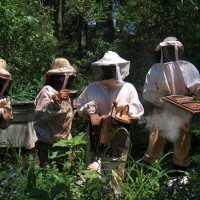 Beekeeping is an important source of income for Aché indigenous communities in Paraguay. Photo taken in Puerto Barra and published on Ache Djawu blog. Global Voices partners with Oximity, a new platform for reading and reengineering the news – watch for RV posts there too! Washington Fellowship for Young African Leaders to invest in the next generation of African leaders. Apply now until 24 Jan.
Funding available from the Clinton Global Initiative, providing $100,000 total to select student commitment-makers through its Social Venture Challenge. Enter your film to Social Impact Media Awards by Jan 7. They are looking for original, wise, brave, eye-opening and creative productions that will increase the awareness of viewers to global injustices. 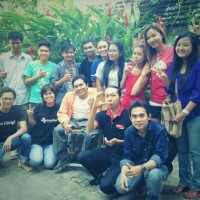 GV Meetup in Phnom Penh, Cambodia. GV Meetups are happening! In the past two weeks we've seen meetups in Phnom Penh, Cambodia; Cairo, Egypt; Kampala, Uganda; and Skopje, Macedonia.